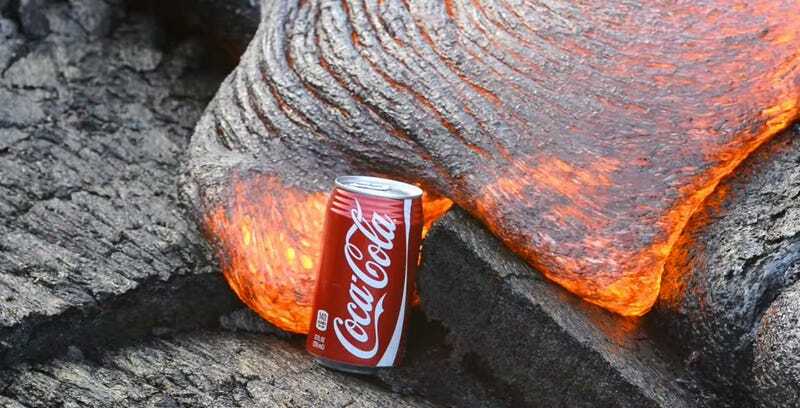 What happens when you boil a can of Coke with a lava flow? Or leave tall can of an energy drink to be engulfed in molten rock? Now that your drink is steaming hot, what does it look like to try cooking ravioli with an encroaching flow? Bryan Lowry takes a lot of footage of the Hawaiian volcanoes. The bit we're highlighting today is pure curious goofiness: eave sealed objects in the path of a lava flow, and film what happens. The lava flows in Hawaii are mafic, lava hotter 950 degrees Celsius. It's low-viscosity, smoothly flowing in a runny mess. Because gas can escape readily, the eruptions are gentle and about as safe as creeping up on molten rock can get. Lowry planted the first can with a pinprick hole in it to prevent random explosion, but the pressure release was enough to keep the Coke piddling out without hitting a dramatic fountain. Next, he tried a fully sealed can, but it toppled over. Not satisfied with the outcome, Lowry tried again, this time armed with Monster energy drinks. The can abruptly explodes, then the can melts in a molten mess around the halfway mark. The best part of running an experiment with sealed objects in a lava flow? It's the most direct form of recycling ever, returning mined minerals back to the Earth. Getting a bit irritated at the lightweight soda cans toppling over at the slightest nudge of a lava flow, Lowry stepped it up with a ravioli can instead. I like watching the top of the can pop out from the building pressure before exploding completely and launching its contents ahead of the flow. When the flow catches back up to the expelled food is a whole different bit of drama, triggering an adorably tiny explosion. For one last bit of food-related lava-flow fun, Lowry repeated the can of ravioli but with the top of the can open. The result is much more gentle, but somehow soothingly pretty. Technically, the empty can was the first experiment, while the rest were all performed months later on the same day. Don't try this at home. Of course if you do have a lava flow at your house, trying this is the least of your problems. Safety precautions were taken and only the GoPro was slightly in harms way. By the end of this outing most of my camera gear was just a bit sticky. There was limited room to move about so, settings are what they are. In related news, have you considered using a volcano as a garbage disposal?